As far as that last comment of yours (you Jellystone-hater you! 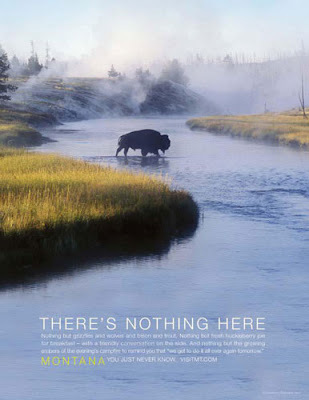 ), I tend to consider Yellowstone to be its own "universe" since it was created well before the states around it. I'll agree with you, though, Montana has plenty of its own grandeur, beauty, and wildlife, minus the 3 million plus tourists per year. We don't need to lean so heavily on Yellowstone - the trick is we've been doing it for a good 130 years or more and it's a hard habit to break. Honestly, because I live so far in the eastern side of the state, I rarely think about Yellowstone. For some reason, Glacier is the Montana park, but Yellowstone just sort of slopped over into our state. It's interesting you'd post this, just now. A friend of mine wrote a book set in Eastern Montana and the editors really wanted to use the "Big Sky" to sell the book. We've been killing ourselves, trying to find a name that would reflect that. Montana has been marketed to death. I can understand the difficulty in coming up with something fresh for ads. All the stuff sounds like bad spaghetti westerns or bodice-busters or so generic, one would never want to take a second look. Jeff! Definitely agreed with you on the current Travel Montana campaign ... for me, it's just embarrassing. And our deliberate misrepresentation of the Montana-Wyoming state line is pretty revolting, on its own. After all their years of doing that, I'm surprised no one has called Travel Montana on that practice yet.